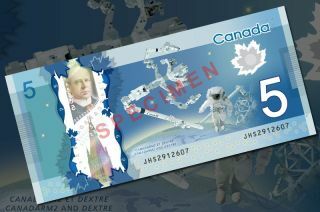 The Bank of Canada's new $5 bank note features a space-theme with the Canadarm2, Dextre and an astronaut. Canadians can now cash in on their country's contributions to the International Space Station with the release of a new five dollar bill emblazoned with the orbiting outpost's Canadarm2 robotic arm. The Bank of Canada began circulating the new $5 note on Thursday (Nov. 7), seven months after debuting the space-inspired design aboard the space station. Recently-retired Canadian astronaut Chris Hadfield, who in April revealed the first of the blue-color bills while serving as commander of the station's Expedition 35 crew, came to the Canadian Space Agency's Quebec headquarters to help launch the polymer currency. The new bill features the Canadian-built Canadarm2 and Dextre, robotic arms and manipulators that were used to build and now maintain the space station and which have gone on to symbolize Canada's ongoing contribution to the international space program. The note's design also includes a spacewalking Canadian astronaut, identified by the country's red and white maple-leaf flag depicted on the arm of the spacesuited figure. "This [design] was suggested by the population," Hadfield said. "They had a contest, [asking] what is it in Canadian technology that really symbolizes what we stand for and what we've done? Canadarm is number one in the country of Canada that ranks at that level of cultural significance." The front of the new five dollar note, which is the lowest denomination bill circulated in Canada, features a portrait of Sir Wilfrid Laurier, the nation's prime minister from 1896 to 1911. The prior version of the bill also depicted Laurier on one side. The reverse featured illustrations of children engaged in winter sports, including sledding and hockey. "So proud of the new $5 bill," commented Dave Williams, a former Canadian Space Agency astronaut, on Twitter. "It captures our imagination and recognizes the women and men [who] built the Canadarm and [who] flew as Canadian astronauts." According to the Bank of Canada, the new $5 bill features "leading-edge security features" as already present in the $20, $50 and $100 polymer notes previously released into circulation. The bank also issued its new $10 note today, which depicts a Canadian train. "The new $5 and $10 bank notes tell a story about the frontiers of our country and even our universe," Stephen Poloz, Bank of Canada governor, said on Thursday. "I join all my colleagues in expressing our pride in the Frontiers series. It is aptly named since each bank note pushes the frontiers of security and technological innovation." The new bills include transparent and holographic design elements, making them the most secure bank note series ever issued by the Bank of Canada. The polymer series is also described to be more economical, lasting at least two and half times longer than cotton-based paper notes, and they will be recycled in Canada. In addition to the Canadarm2 and the two-armed Dextre, the latter also known as the Special Purpose Dexterous Manipulator (SPDM), Canada's space achievements also include the original Canadarm, the robotic manipulator that was flown aboard the now-retired space shuttle fleet.